Let's talk homemade toys. I recently made my almost 2-year old a set of animal magnet puzzles. She loves animals, magnets and puzzles, and thanks to free online printables and my local dollar store, her animal-magnet-puzzle dreams came true without too much effort or cost on my part. The hard part was choosing which printable to use. I waffled between these dressed-up animals and these matryoshka dolls, but ended up being drawn in by the colourful, simple illustrated animals from these Mr. Printables bookplates. Cut out each print-out character. If there are areas that are skinny (e.g. long tails or ears), consider cutting no closer than 1/4" around the character, to ensure that your cut-out can endure rough child handling (i.e. less prone to ripping, etc). I used a 1/4" space around each character, as I liked the extra pop of colour that came with the outline. Using the character cut-out as a guide, roughly cut a rectangular piece from a foam sheet larger than your character, with the non-adhesive side touching the non-printed side of the character. Remove the adhesive backing from the foam cut-out, and firmly adhere to one of the corners of the magnetic sheet. Cut the magnet to match the rectangle. You should now have a rectangular piece of foam that is magnetic on one side. Repeat for each character. 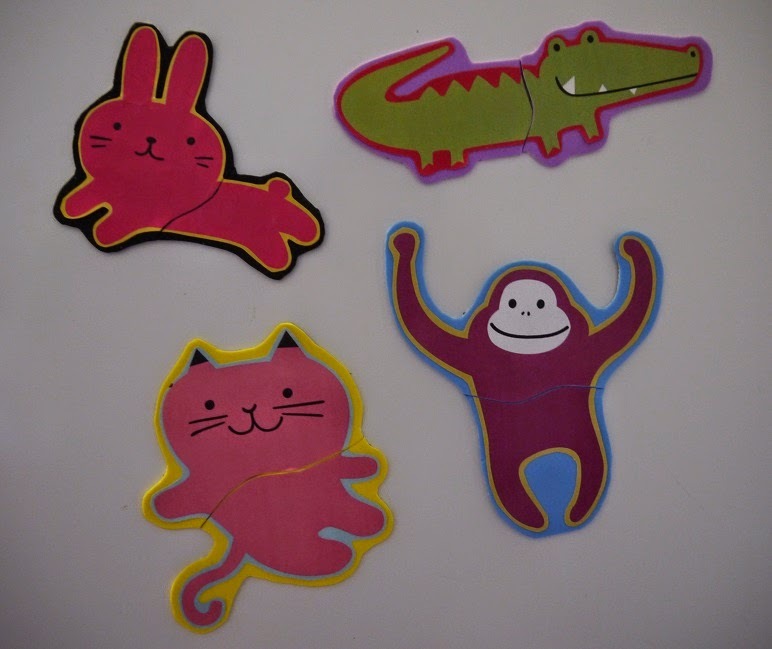 Loosely glue the characters onto their matching foam piece using mod podge or glue. Cut the foam-magnet to match the shape of the character, leaving a space of foam at least 1/4" around the character. Select a good halfway point where to snip the character in half (creating 2 puzzle pieces). Separate the paper character from the foam, and make a wavy cut in the paper at the halfway point. Note that the paper is cut separately to ensure a sharp edge. Re-glue one half of the paper back onto the foam, and cut the foam with the same wavy cut using the paper as a guide. Re-glue the other half of the paper onto its foam. Repeat for each character. You now have your magnet puzzles made, but I would recommend the following additional steps to be certain the paper is glued down well. Double-check your gluing to ensure all edges are well-glued; if not, add more glue and press down. Place all magnets on a flat surface, and apply a heavy flat weight on top for at least 30 mins to ensure a good bond. Remove weight, and brush on a thin coat of mod podge or craft glue to the foam/paper side, to act as a light sealant. Leave to dry for at least an hour. cute! my baby loves animals too!